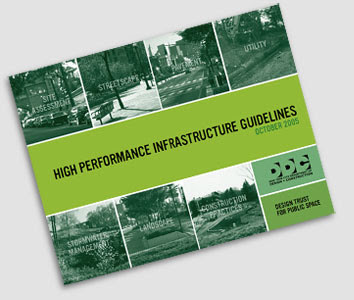 In searching for some new landscape-related links to explore, I stumbled across the blog for Design Trust for Public Space (aka I (heart) Public Space) and their 2005 publication High Performance Infrastructure Guidelines. This "...detailed handbook describes practices for creating sustainable city streets, sidewalks, utilities, and urban landscaping. Following the acclaimed High Performance Building Guidelines, this sister publication launched a new era in the design and construction of public infrastructure." Looks like another version, High Performance Landscape Guidelines, will be available in 2009. This definitely has parallels with the Living Site and Infrastructure Challenge (Cascadia GBC), as well as the Sustainable Sites Initiative (ASLA) which is starting to broaden the discussion (and tools) for site-related sustainability. 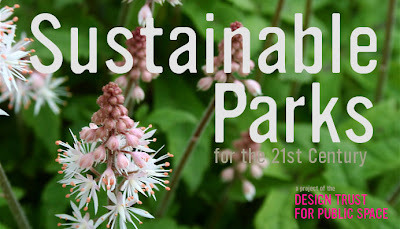 Another more focused resource is an intriguing NYC-related blog, Sustainable Parks for the 21st Century - which holds promise, as: "...this project will provide the Parks Department with research and instruction in methodologies for the creation of high-performance park design, helping the City bring its 29,000 acres of parkland into the new millennium." And a little bit about the broad organization, via their site: "The Design Trust for Public Space is dedicated to improving the design, utility, and understanding of New York City's parks, plazas, streets, and public buildings. As the only New York City organization devoted to bringing private sector expertise to bear on public space issues, we generate powerful working relationships that enrich the urban experience for all New Yorkers by making the city more sustainable, functional, and available to all." The landscape architecture profession definitely needs to push these boundaries of sustainable sites - and definitely communicate and collaborate with consistency - but also don't place all of our eggs in one basket, such as the ASLA sponsored Sustainable Sites Initiative. I like the idea of regionalism, which is more appropriate for sustainability, versus a one-size-fits-all LEEDesque approach. What does a sustainable park look like in NYC, versus Portland, or Tucson? This is a great question. Are there consistent themes? Absolutely. Do these need to be refined and adapted to local places - including values, climate, and opportunities? Even more so. So I will read these documents for ideas, and look to apply them on this coast... looking forward to it. Thanks Tom... checked out the site and definitely work a repeat visit. In this time of universality and westernization of the world - it's interesting to remember how local is important in sustainability - the idea of 'Local Planet' is a good, accessible metaphor.